The Youth Activist Academy has officially launched. It will see a group of young people working on LGBTIQ+ sports projects over the next year while achieving their Community Achievement Awards. LEAP Sports Scotland has launched it’s new youth project ‘The Youth Activist Academy’. 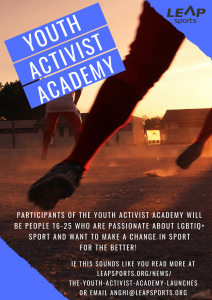 The Academy will welcome 26 young people aged 16-25 through it’s doors to train up as LGBTIQ+ sport activists. The young people will take part in a residential in June with speakers and workshops about activism, Football v Homophobia and LGBTIQ+ sports! Once the academy participants have completed the residential they will split into peer lead groups. They will implement community projects that will work towards creating inclusion, participation and visibility for LGBTIQ+ people in sport. Not only will participants graduate as Sports Activist they will also receive a Community Achievement Award. If you work with young people and want to promote this opportunity you can email anghi@leapsports.org for more information or share the flyer. If you are interested in taking part in this project you can apply here or email anghi@leapsports.org for more information.